The last two weeks of June and July we enjoyed by relaxing in TN before heading up the east coast to our month-long stay in Montreal at the end of July/beginning of August. We got things in order in Nashville and visited with Nicole and Jose and then Mayne’s parents in Knoxville. It was a short visit but we are happy for every chance we get to hangout with the family. 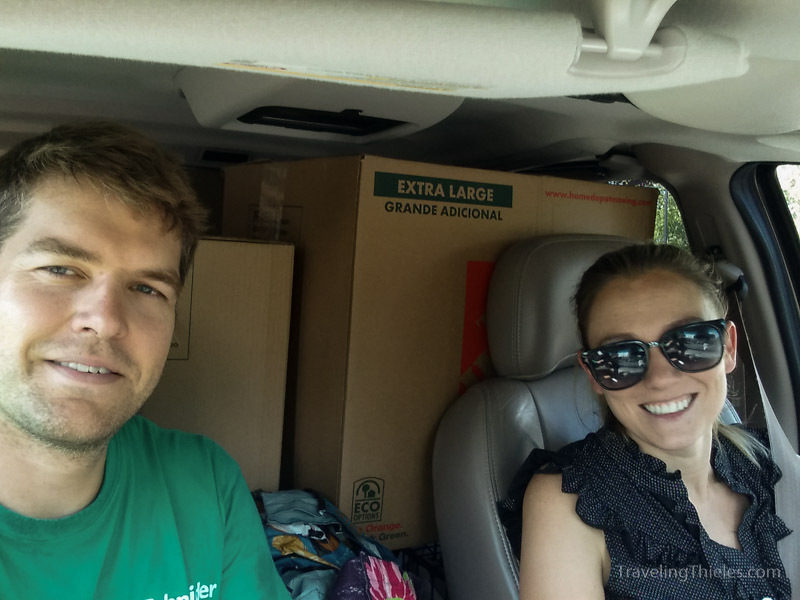 After TN we decided to spend a week each in the Raleigh, Richmond and Wilmington, DE areas. The first two were mainly because we had them on list to visit and the last was because there was a Staybridge Suites on the IHG pointsbreak list for just 5k points per night and the location seem pretty centrally located in the area. Our goal for the month (apart from seeing some new places) was to get in a good amount of product sourcing since we weren’t sure if we could do much from Canada. As a result of all the sourcing that we had done in May, we had some awesome sales numbers our first couple weeks in Europe, but they rapidly declined towards the end of the month. It’s a nice feeling to be on vacation for a month but daily being able to check in and see all the stuff that sold! The weather was a scorcher here in the SE and a shock to our systems since we had become accustomed to the beautifully cool weather during our stay in Europe. 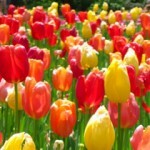 It has made us more convinced that we need to find a way to become snowbirds and live up north in the summers. You could say that retirees are role-models for us in this way (among others). 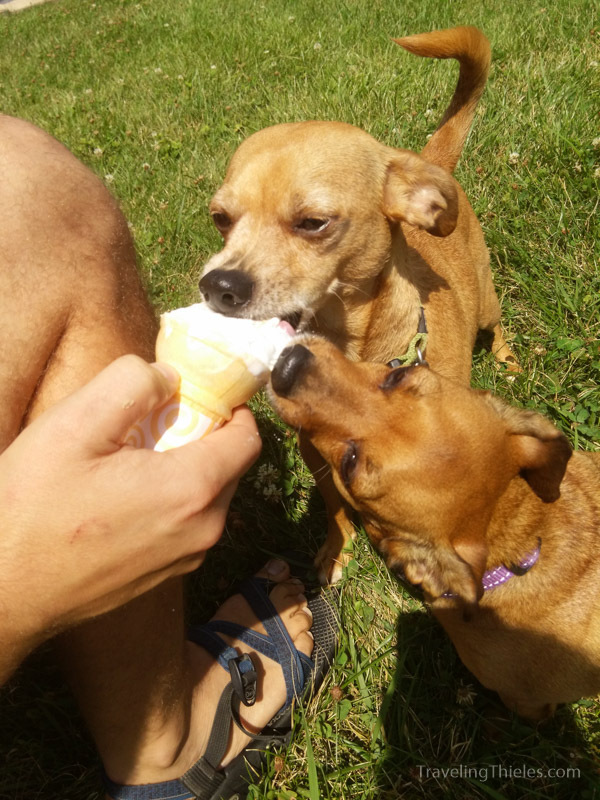 The pups got a special treat from McDonalds to cool them down. In her impatience to get something to quench her thirst, Nora prefers to drink straight from the bottle. She’s a funny little dog.. 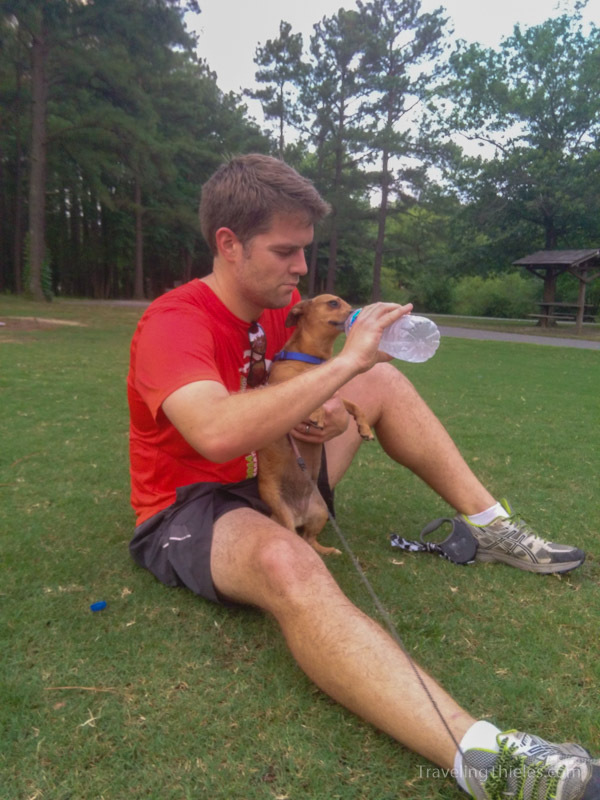 This was at our favorite park in Richmond – the Deep Run Park where we went almost daily for runs. Our first stop after TN was Raleigh, which we enjoyed despite the heat. Our Staybridge Suites hotel there was also on the pointsbreak list so we stayed for 40k points for 8 nights. We had a wonderful visit with Elisa’s aunt Shelley, uncle Jim and cousins Jessica and James. They were nice enough to be tourguides for us and we had fun day with them hiking at Umstead state park, touring the Duke gardens (which were wonderful and free), and then dinner and desert at a couple of restaurants chock full of character. Umstead State Park is a huge forest just on the outskirts of the city. For trail-runners this place is heaven. In the fall it would be spectacular. Apart from the Umstead park, we discovered that Raleigh had a number of great parks and in general, is a very green and attractive city. Our other top park pick would have to be Lake Johnson Park, a sizable reservoir ringed by a loop trail and a small beach for swimming. 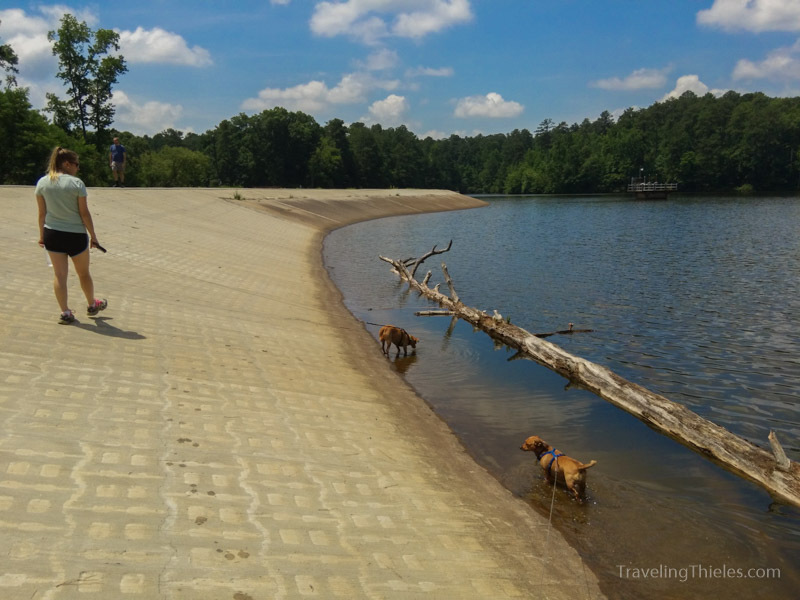 We went for a long hike all the way around Lake Johnson – the dogs loved refreshing themselves in the water. Umstead park is a thick forest that appears to never have been logged. There are miles of trails undulating over shallow hills and plenty of places to escape from the noises of the city (with the exception of jet airplanes which occasionally pass overhead due to its being right next to the airport). After Raleigh we traveled north to Richmond, VA area. We had an affordable but nice Candlewood Suites on the west side in the kind of “big-box store utopia” which dominates on the outer ring of any North American city. 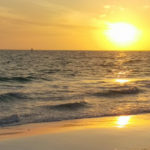 It’s always a challenge for us in these kind of places because on the one hand we have plenty of options for inventory sourcing and affordable lodging options, but conversely we usually have to drive to take the dogs for walks or to visit the unique places of the city. Our opinion of Richmond is probably immature since the weather was crappy (hot and/or wet) while we were there and we therefore spent most of the time inside either working or driving. The highlight of our visit was probably getting to visit with our friends Brandon and Valerie, who we met in Charlottesville, VA for an afternoon. 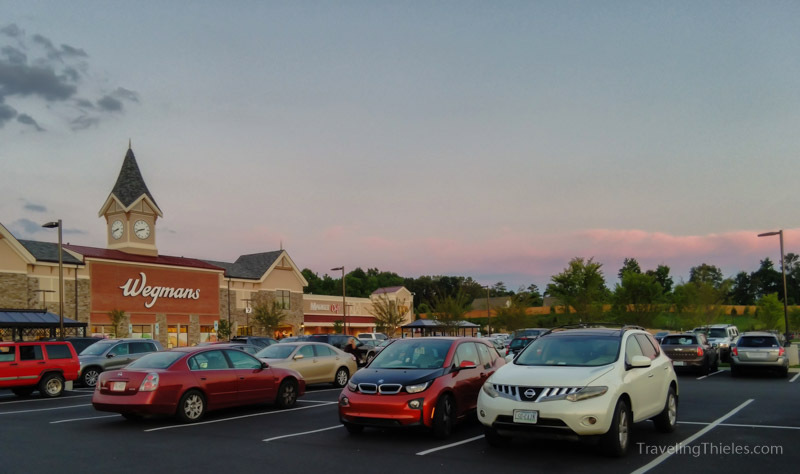 Elisa managed to find a Wegmans that had just been built in the Richmond area (they are moving south – come to Nashville please!). We drove like an hour round-trip to visit this one. 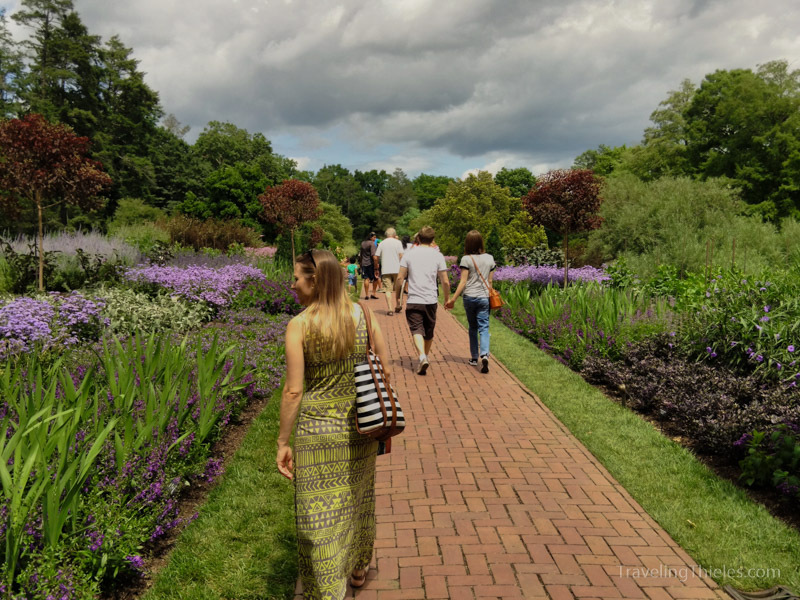 Wilmington, DE was our last stop before going up to Canada, and the area which it resides in – just off the Delaware bay 45 min south of Philly and north of Baltimore – is now one of our favorite spots along the east coast. 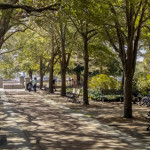 Of the many superlatives for the area, we would highlight: close proximity to at least 4 international airports, close to both NJ and DE beaches, gardens everywhere, no state income tax, cool-ish weather in the summer, very quaint and historic towns and buildings and plenty of parks to choose from. 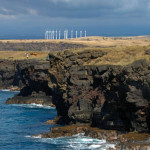 Unfortunately, the lack of state income tax – particularly in the New England area – comes with a price. 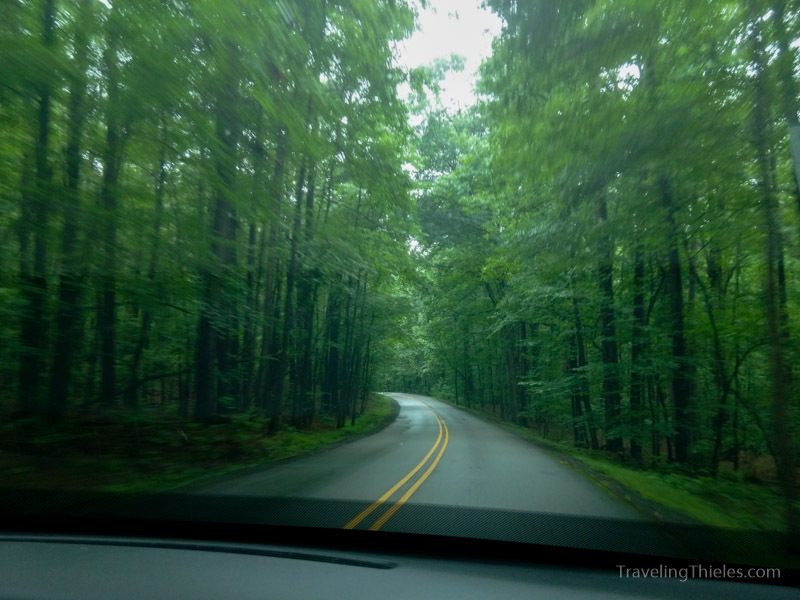 We felt a little “nickel and dimed” during our stay, having to pay extra for many things which we normally use a lot of but don’t pay per visit like roads (almost $20 to visit the beach on the weekend) and parks ($8 per vehicle at the DE state parks). 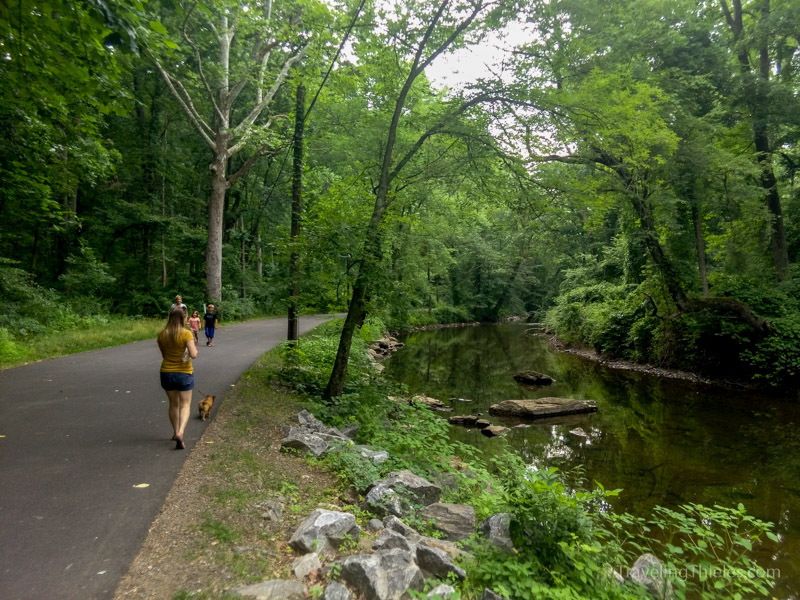 That being said, the actual state of Delaware is very small and you can go just over the state line into PA for some amazing parks as well.. For example, we visited the Ridley Creek State Park 3 or 4 times since it has a great 5 mile paved loop, ½ of which follows a meandering river. 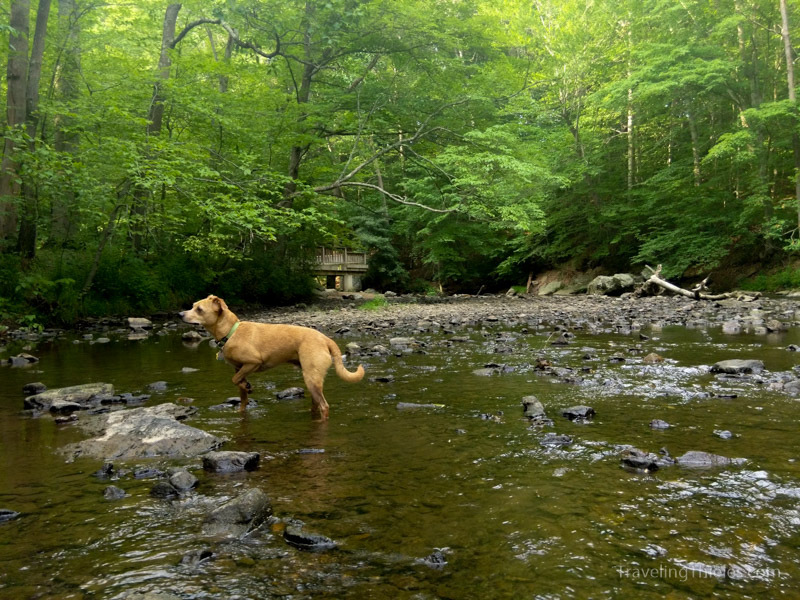 Walking the paved loop at Ridley Creek. 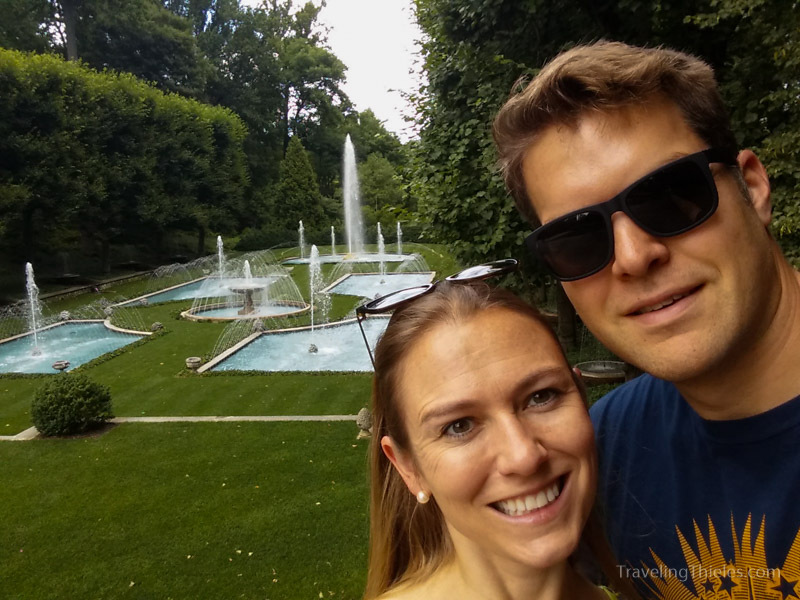 The only garden that we got a chance to visit was Longwood Gardens. It was purchased by Mr Dupont (of the plastics family) over 100 years ago and over time turned into an amazing horticultural exhibition. 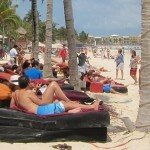 We enjoyed several hours there but would love to come back and visit during the other seasons. 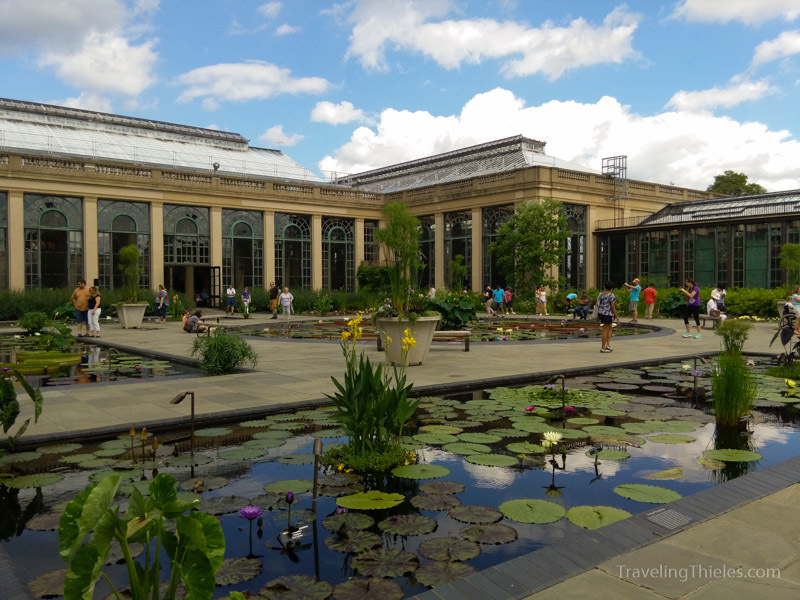 Longwood Gardens has some of the best curated displays we have seen. This Italian-inspired water garden has hundreds of fountains that move and “dance” to a silent soundtrack. Dupont also created entertaining areas, like a ballroom with a massive organ consisting of 110k pipes. 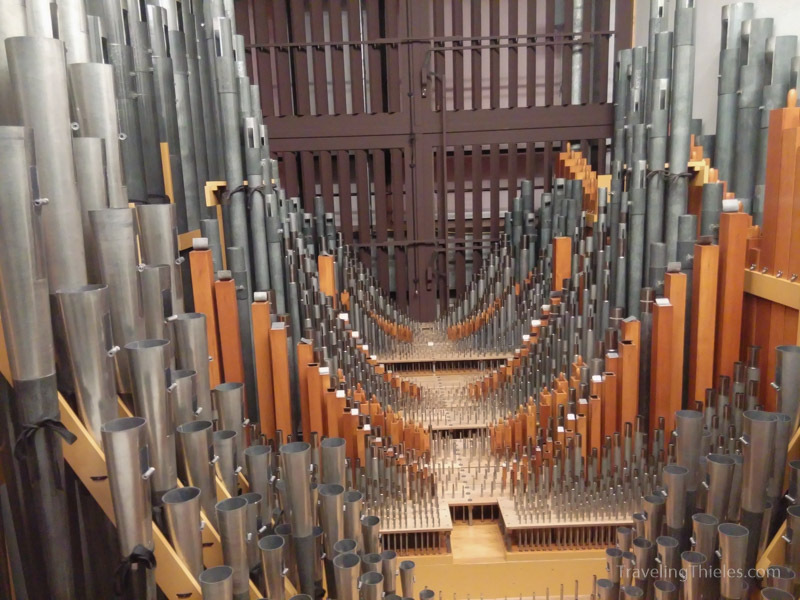 As a visitor you can get a behind-the-scenes look at the many varied pipes and hear them in action at certain times of the day. There is a unique water garden area with all sorts of beautiful water lilies and other flowering plants. 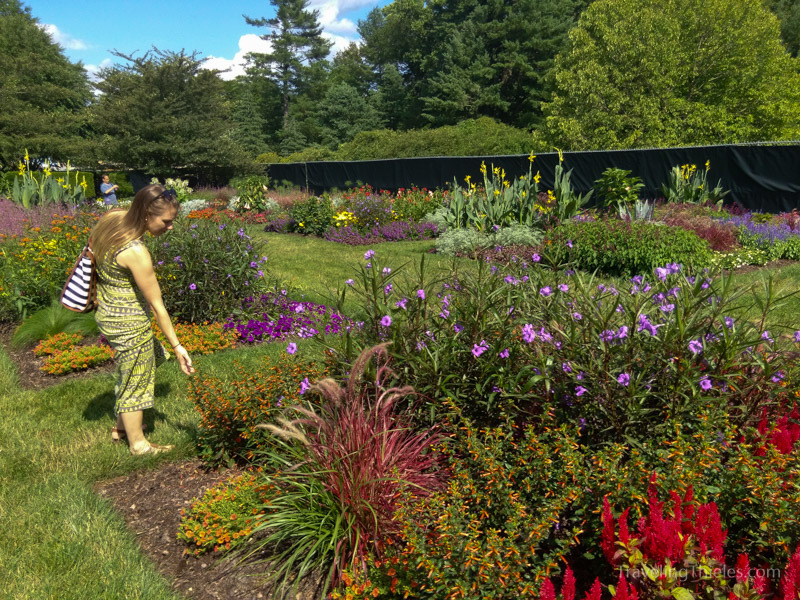 At Longwood there are interesting themed gardens – plants organized by sun needs, colors, textures and smells. 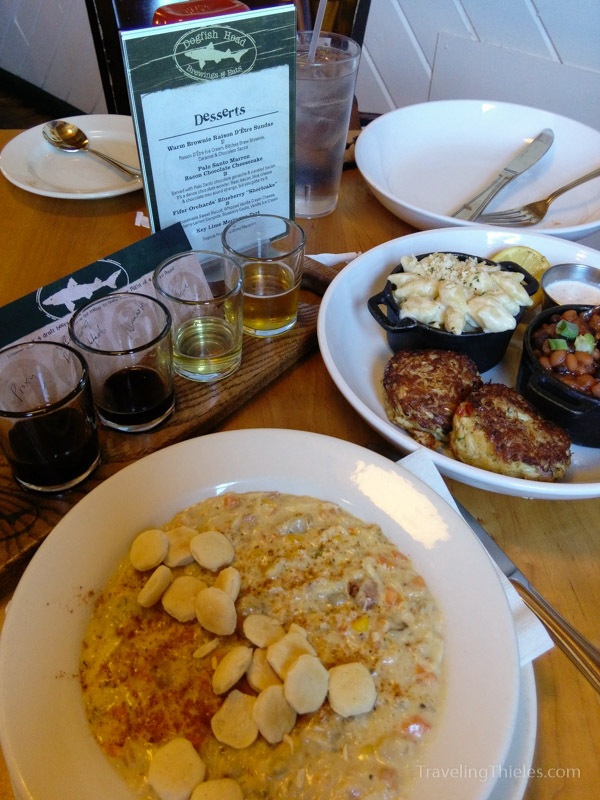 The food at the Dogfish head café in Rehoboth Beach is very tasty, just like the beers. Pictured is a hearty serving of crab soup and crab cakes with a side of mac-n-cheese and baked beans cooked in stout beer. All of it was delicious. 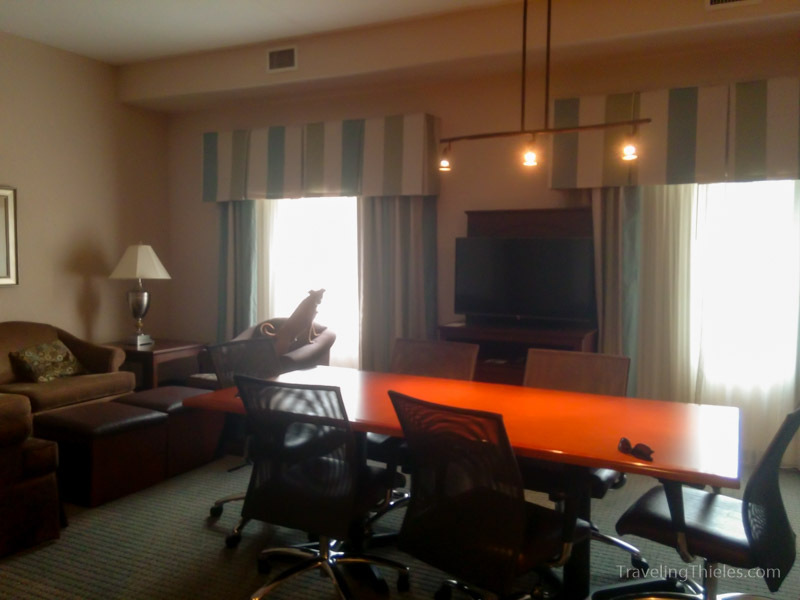 We chose another Staybridge Suites on the pointsbreak list for our stay, this time getting upgraded to the “executive” room with our own meeting table and separate living area and bathroom. The table actually came in handy for processing inventory, having some nice cooked meals and getting a lot of work done for the business. Excellent suite at Staybridge would probably have been worth paying for if we had not gotten it for free. 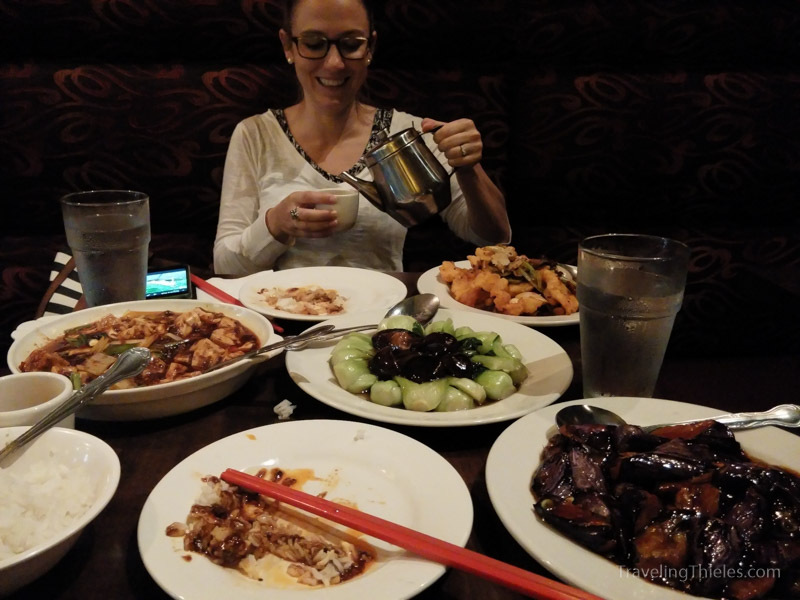 Check out our spread from Han Dynasty – our vote for best Szechuan food on the east coast. We got some red pepper fried fish, mapo tofu, baby bok choy and garlic eggplant. The oolong tea is free too! Love all the pics. Thanks for sharing. Be safe. Love you.